Imagine you are at the top of a very steep, icy ski trail, one that is far beyond your skill level and there is no other way down. As you look down the slope, your heart starts beating faster, your blood pressure rises, your stomach churns and your jaw clenches. You feel stress and fear. In Kelly McGonigal’s TED talk, she discusses a paper, “Improving Acute Stress Responses: The Power of Reappraisal” by Jamieson, Mendes and Nock. They examined what would happen if we treated the stress response as helpful. They taught people that the feeling of stress, the physical experience of your heart beating faster and your muscles tightening is your body’s way of getting ready to tackle a challenge. That it actually helps you to perform challenging tasks. So, instead of believing that these physical sensations are unhealthy stress and something to avoid, they are your body preparing you to do something hard or challenging. People who perceive stress as a threat physically experience a constriction of their blood vessels and a decrease in their heart efficiency. This is why stress can be a leading cause of health problems. Many of the kids I work with experience regular headaches and stomachaches. So what happened to the people in the study who were taught to think about stress as their body getting ready for a challenge? Well, their blood vessels remained open and their heart efficiency improved. This response is similar to what happens in the body in moments of joy and courage. How amazing is that! It’s not the experience of stress that causes potentially damaging physical responses but the combination of the stressful event and how we think about it. Yes, how we think about it! Let’s go back to the top of that ski slope, you’re still up there and your child is up there quite often, too. But your child’s ski slope is made of things like homework, going to school, talking to new people, separating from you or trying new things. Teaching your child that the physical stress response is a helpful tool to prepare them for a challenge changes their physical stress response, makes it more likely they will be successful in handling the challenge, and creates confidence. How interesting! I am looking forward to learning more about how a change in perspective can change behavior responses. Thank you, Alison! I’ll be including more techniques in future articles. Make sure you sign up for the Growing Up Confident Newsletter so you don’t miss future articles. 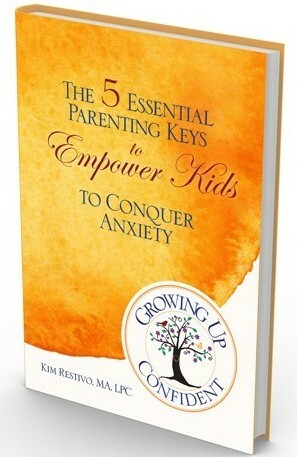 I am excited to read your ebook my daughter just got diagnosed with ADHD and Anxiety. I want to help her in anyway I can. It’s so great that you are reaching out for support. I’d love to know how the techniques in the eBook work for you and your daughter. Email me any questions that you may have. Glad we connected!